The End has come – at least for Brookyln where the new cafe slash beverage mecca The End is supercharging locals with a menu of plant-based potions, lattes and elixirs. With drink names as irresistible as their ingredients – the ayurdevic “bonfire cider” and blue-green algae infused “unicorn latte” are major stand-outs – this place is the kind of high-vibe cafe we hope goes bi-coastal stat. Why I Drank It: I love the zip of fresh ginger. Somehow, any drink liberally spiked with the root immediately makes me feel like I’m doing something good for my body, and in winter I love a heavy hit of the stuff warmed into a tea. As a kid, when I wasn’t feeling well, my grandmother would make me an elixir with half a lemon, honey and lots of fresh ginger, boiled as a tea — and a similar such drink is on offer at Williamsburg’s The End. Here, the Radiance Dust Beauty Latte calls for Montauk Juice Factory’s Radiance Dust juice (ginger, turmeric, camu camu, sea buckthorn, chamomile blossoms), which is heated and blended with coconut milk and butter, plus collagen. Why You Need It: The kids behind Long Island’s Montauk Juice Factory threw open the doors to their whitewashed juice box over the summer, but they’ve just recently rolled out a new menu of plant-based tonics aimed to pep you up or chill you out, or remedy that cold. 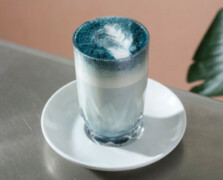 There’s an Earl Grey tea latte with rose petals, and even an aptly named Psychedelic Blue Unicorn Latte hued with algae. Because healthy can taste good, too. Share the post "NYC Sip of the Month: Unicorn Lattes + Beauty Tonics In Brooklyn"
You hooked us with The Unicorn Latte and then didn’t tell us what the ingredients were. pretty but aren’t Hydrangea macrophylla toxic to humans and pets! But how does it taste? Does it taste good? At the risk of sounding like a nag, there is a typo- evan, instead of even. Do not let a typo stand in the way of what you have to share though….the exciting combos have perked my imagination in January! Thank you.